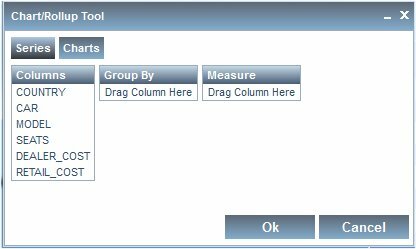 The Chart/Rollup Tool enables you to select multiple group fields in the Chart or Rollup Table generated. 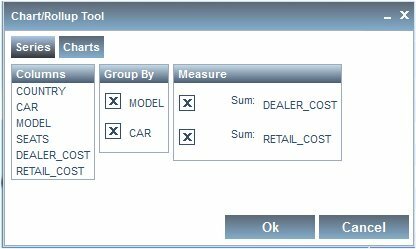 The Chart/Rollup Tool contains a list of columns available in the active report and Group By and Measure sort fields. Drag the columns into the desired sort field. Run the active report, click the arrow in any column heading, and select Chart/Rollup Tool. The Chart/Rollup Tool opens, as shown in the following image. Drag the columns into the Group By and Measure sort fields. For charts, the Group By section is the columns used for the X-axis and Measure is the columns used for the Y-axis. You can edit the sort fields by clicking the X icon to delete columns, drag multiple columns into the Group By and Measure sort fields, reorder the sort fields, and change the aggregation type of the Measure by clicking the Calculation icon. You can select the Line, Pie, Bar, Scatter, or Rollup icon. Pie chart is selected by default. 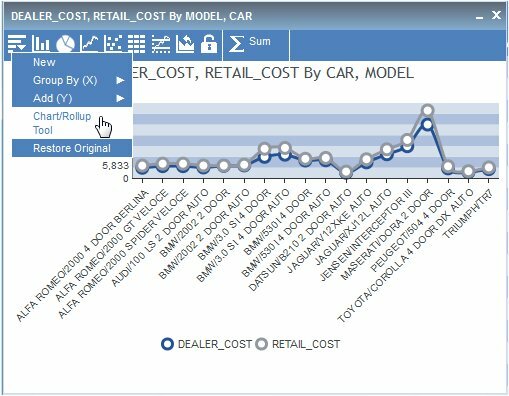 In the example below, CAR and MODEL are the Group By sort fields, DEALER_COST and RETAIL_COST are the Measure fields, and Line chart is selected. Click OK to close the Chart/Rollup Tool. The Chart or Rollup Table is generated based on the sort fields selected. You can click the New icon from the Chart or Rollup Table and select Chart/Rollup Tool to open the Chart/Rollup Tool again. You can use multiple Group By and Measure sort fields. The Group By section is the columns used for the X-axis and Measure is the columns used for the Y-axis. You can only use one Measure sort field (as the Y-axis) when using a Pie chart. The same column can appear in both the Group By and Measure sort field. Columns can be dragged between the Group By and Measure sections but they cannot be dragged back to the Columns section. When you use the Chart/Rollup Tool with hidden fields (HIDE=ON StyleSheet setting), the hidden columns are not displayed in the Rollup Table. To display the hidden columns in the Rollup Table, select Show Columns from the active report menu, and select the column name you want to display.